Escape the hustle and bustle of Seattle and enjoy a day of breathtaking scenery at Mt Rainier National Park. 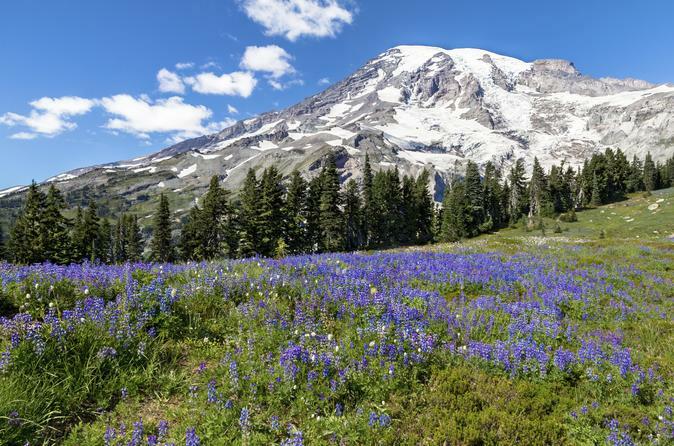 On this private Mt Rainier tour, take a scenic drive through the old-growth evergreen forests of America's fifth-oldest national park, affording views of sparkling lakes, flower meadows, massive glaciers and sweeping alpine vistas. Visit Narada Falls, Reflection Lake and Lake Louise, and stop along the way to view wildlife and take photos. Learn about the park's history at the Paradise Jackson Visitor Center and Longmire Visitor Center and Museum, and bring a picnic lunch to enjoy amidst the scenery. After pickup from your Seattle hotel in the morning, your private guide will drive you toward Mt Rainier’s iconic snow-capped peak. Rising abruptly from the surrounding land, this dormant volcano is the highest point in the Cascade Range and is easily visible from Seattle. Take an approximate 2-hour drive southeast to Mt Rainier National Park, the fifth-oldest national park in the US, established in 1899. Enter through the Nisqually park entrance and continue up the winding road to the new Paradise Jackson Visitor Center, situated at an elevation of 5,400 feet (1,646 meters). After learning some history about Mt Rainier, your guide will take you on a scenic drive through the park. Driving routes may vary based on the weather, season and road conditions, but your guide will make any necessary changes to enhance your tour experience. You’ll be delighted by endless views of old-growth evergreen forests, flower meadows, sprawling alpine vistas and snaking rivers. Visit Narada Falls, Reflection Lake and Lake Louise, point out wildlife with the help of your guide, and spot glaciers radiating from the summit of Mt Rainier. During your frequent stops, take time to walk around, savor your surroundings and take photos of the incredible scenery. You’ll also visit the Longmire Visitor Center and Museum to learn more about the park's history, glaciers, geology, ecology and wildlife. You’re welcome to bring a picnic lunch to enjoy at the picnic area, or purchase food at the concession stand. There’s also a gift shop for you to peruse. At the end of your private Mt Rainier tour, relax on the drive back to Seattle.